While the central Colorado mountains were hammered by wave after wave of winter storms in January and February, the last Friday of February 2006 signaled that spring is near. Blue skies and fairly warm temperatures with little wind provided near-perfect conditions for a half-day of skiing at Copper Mountain. Although no new snow had fallen for several days, a beefy 71-inch base, exceptional for this time of year at Copper, made for a great day of criss-crossing the inviting terrain of the mountain. 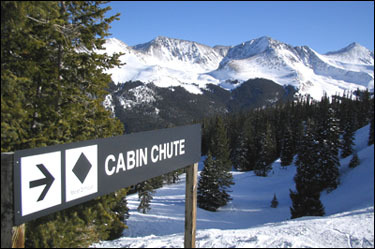 This day highlighted the beauty of weekday skiing at one of Colorado’s best ski areas. Horror stories of Saturday morning drives up I-70 and Sunday evening return drives to the Front Range continue to add a black eye to the Colorado weekend ski experience. While Copper’s strengths as a ski area have traditionally been its long intermediate and expert runs under the Super Bee and Alpine lifts, the resort’s upper mountain terrain has added an exciting dimension to the resort. From the top of Super Bee, traversing across the mountain to the Storm King poma lift provides access to the aptly named Enchanted Forest. If the line at Storm King is less-than-inviting, breeze past it to the crossroads of Hallelujah and Enchanted Forest. Following a narrow ridge to Enchanted Forest leads to several excellent steep runs. To the other side of the upper mountain terrain, the Sierra and Rendezvous lifts provide access to several high-altitude steep and challenging trails. At an elevation of over 12,000 feet, this alpine terrain is exceptional, especially the glades of Lower Enchanted Forest, rated a double-black diamond. The deep base this season means that skiers can turn on the steeps and venture into the trees without much fear of hitting rocks or other obstacles. Back at the crossroads, Hallelujah, rated an expert single-black diamond trail, is a very fast, nicely pitched run with medium-size moguls perfect for carving short, fast turns. The relatively short run leads to the Excelerator lift, providing a quick ride back up to the top of the run. Back on the front side of Copper, the Alpine lift, an old-school, slow double-chair lift, serves three classic expert mogul runs: Far East, Triple Threat and Too Much. On this day, Far East offered up large moguls on a steep slope with few skiers in sight. These long, challenging runs provide plenty of bang for the buck, and, unlike some other black diamond runs on the hill, are genuine expert runs. Moving back and forth across Copper Mountain is relatively painless, a tribute to this well laid-out mountain. Within the boundaries of Copper Mountain, there’s more than enough terrain to keep skiers busy for several days, making this area a good choice for a multi-day stay. 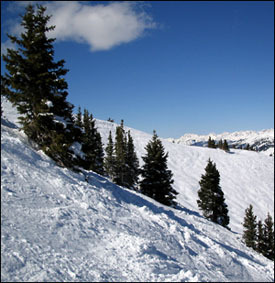 Front Range skiers, such as myself, benefit from the low-cost 4 passes sold before the season. We all owe a debt of gratitude to those unfortunate souls forced to pay the stratospheric $75 per day lift ticket price at the window. The beauty of the popular Copper 4 pass (which I bought pre-season for $59; out-of-staters, check eBay) is that there’s no guilt in skiing a half-day and counting that toward one of the four days. Especially on days when there’s no fresh powder, leaving the Front Range at mid-morning and arriving before noon gives one plenty of time to rack up 10 runs or more (on weekdays, that is). Dismal and disappointing. A black eye.